Outputs: PDF Formula field not calculated; exporting hidden tabs? Hi All - I tried to save an Omniscope dashboard as a PDF document. Looks great, except for the fact that formula field are not calculated in the printscreen. Is this a chosen setting or a bug? 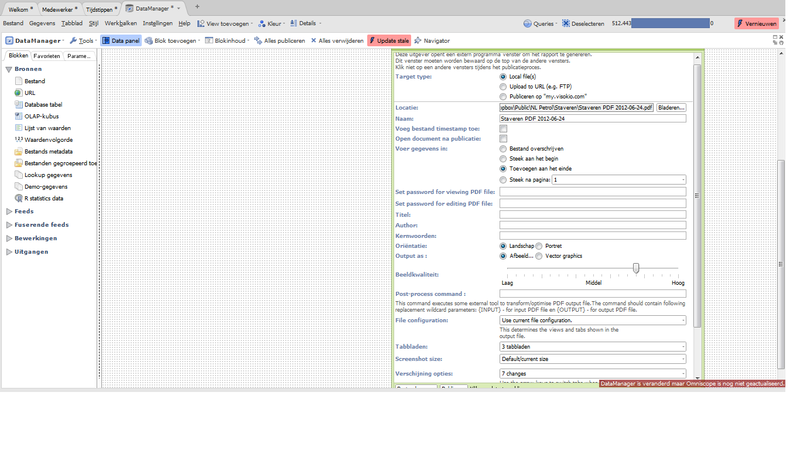 Can you post a screenshot of your PDF output configuration? Thanks for sending that. Would it also be possible to post a screenshot of the DataManager workflow? The PDF output comes directly from an Omniscope block. Maybe a short screen sharing session can give you info you need. Ok sounds good, i've sent you an email offline.